Sherita Dill is Studio Manager for the Material Memory project. 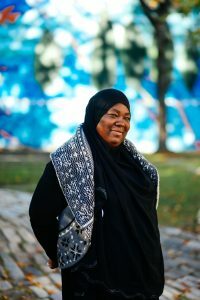 Sherita Dill is a chef, mother of four, and the studio manager for the Material Memory project. Sherita Dill was born and raised on Stenton and Haines streets with her five siblings. She values family, friends, dignity, hard work and dedication. Sherita has a passion for working with people, and shares her culinary skills in the community. Her soul food cooking is available for catering and private parties; contact shdil.sd@gmail.com. Sherita brings her big, loving family into the studio to help out. Daughters Nina, Tamara, and granddaughter Zakiyyah are a joyful part of each studio day.